Emma Moon’s mother thinks it’s acceptable to miss her only daughter’s wedding rehearsal dinner for a work obligation. Her father left when she was six months old. Emma hasn’t exactly been raised to be a happily-ever-after kind of girl. Amy FitzHenry, a Virginia native, attended the College of William and Mary and the University of Virginia School of Law. After law school, Amy practiced as a litigator in a large Los Angeles-based firm. She is currently living in LA and, when she isn’t writing, practices law as the in-house counsel for the global men’s health charity, the Movember Foundation. 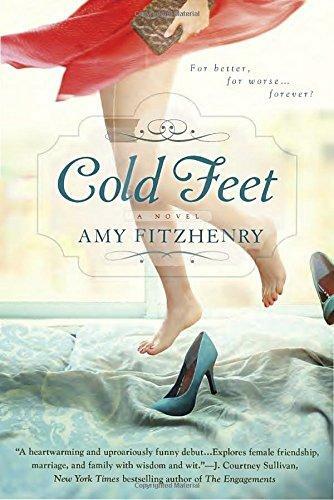 Cold Feet is her first novel. What did you think of Emma as the story’s protagonist? Did you relate to her? Were you frustrated with her at times? If so, why? Emma clearly has a blind spot when it comes to her personal life. What are some instances of this and how does she begin to see things more clearly as the novel progresses? In the law, most people who commit crimes require a certain level of mental involvement, as well as physical action, in order to be found guilty. “However, there are also crimes that don’t require any level of mens rea, called ‘strict liability’ crimes. It doesn’t matter whether it was your intention to commit the crime . . . if you committed the physical act, you’re as guilty as they come.” [p. 107] Is infidelity a strict liability crime, or should other factors—such as the number of times, the intent, the state of your current relationship—be taken into account? When considering the various accounts of adultery throughout the novel, do you think unfaithfulness is ever forgivable? Which characters in Cold Feet would you have forgiven, and why? As a sharp-eyed lawyer, Emma often applies her knowledge of law to matters of the heart. Do you think one can inform the other, or is this application futile or even detrimental? Cite examples from the novel. Emma forgives Liv for lying to her much more quickly than she forgives Sam. Do different rules apply to your closest friendships than they do to your romantic relationships? Why or why not? “The ability to freeze my pain and tell myself not to be sad . . . was one of the things I was most proud of . . . Why would I stop doing the thing that got me through life up until this point?” [p. 93–94] Does Emma’s coping mechanism make her strong and resilient toward adversity, or is it a temporary fix that, as Dr. Majdi advises, won’t serve her well in the long run? Is there any positive value to coping mechanisms? “I don’t think we should talk about it . . . it’s going to upset you, and I really don’t think it’s worth putting our friendship in jeopardy over.” [p. 277] Is it sometimes better not to talk about something, or even to lie about it, in order to protect your relationships, or is honesty always more important? Consider Liv, Caro, and Sam’s dishonesty with Emma as you consider the question. Did you sympathize with Val or were you angered by her actions? If you were in her position, would you have felt obligated to tell Emma the truth? At the end of the novel, Sam performs a grand romantic gesture for Emma. In your opinion, was this act enough to merit forgiveness? Has a similar grand gesture ever won you over or, alternately, not been enough to change a situation for you? By the novel’s end, Emma finally gets some answers about her father. Does this information inform her relationship with Sam? How or how not? “In some cities not only was the crime itself illegal, but they were also putting a burden on any witnesses who failed to report the crime.” [p. 125] Do passive bystanders have liability for a crime? What about witnesses to crimes of the heart? “If you were betrayed, you had a right to know. You had a right to expect someone, anyone, to tell you.” [p. 126] Do you agree? Do you think there is room for reparation and growth between Emma and Caro, or will their relationship continue as status quo?